Misting with Markers! Stamp Simply Ribbon Store — Be True To Yourself! Misting with Markers Video Tutorial! Good Friday morning! I hope you had a good day yesterday. Mine was mind blowing. I finally figured out why I’m having such trouble getting my videos done. My new camera is MP4 and my software doesn’t work with it . . . well yeah, I knew that, but it finally occurred to me to get a converter. Hopefully editing and uploading a video won’t take all day now! I made three cards using the Misting with Water technique, each different but with the same image, papers, etc. The difference is with the method of the technique. The first card I showed you yesterday. Here are the other two. Misting the paper and the stamp before stamping. Misting only the paper rather heavily. Well, I’m off for my 6-week surgical checkup today. Thanks for stopping by and remember life is short, make the most of each day and enjoy the adventure! You are AWE inspiring! This is such a great technique & perfect video tut. I just LOVE the effect & the colours you’ve used and that stunning bow–AND the background layer–off the hook GENIUS!!!! Hope your check up goes really well. Thank you Sooooohh much for ROCKin the craft world! Great video – thank you for showing all the different methods for getting different results. I have played with this technique before but I think I was misting too close to the stamp. Also loved your little helpful hint about using canned air to get those pesky lint fibers off the stamp! I have been known to blow on a stamp to do this but I get light headed after a bit! LOL! that was so cool, how pretty they all look.didnt realize was so many differant ways .your so cool !! love your videos. Great tutorial Sherry. Thank you for sharing your talents with us in cyberland. Awesome. You are just a natural teacher. Love all these techniques and can hardly wait to try them. Look forward to more videos from you. Thanks so much. Great video, thanks for showing all the examples, and what a great idea to clean up the stamp, tfs! This was awesome – thanks so much. I discovered from watching you I was holding my mister too close to my image. Can’t wait to try again. 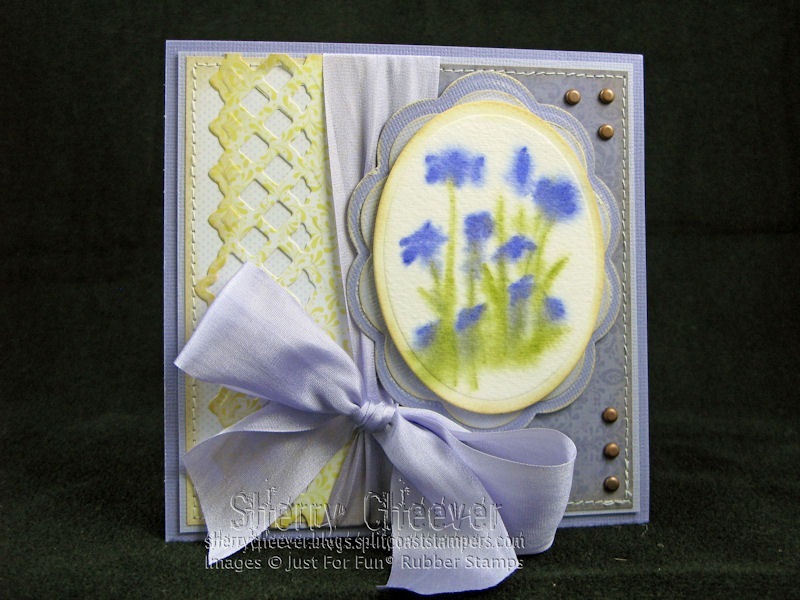 Sherry, I love this wiild flower card with the water misting technique. Always enjoy your cards and tutorials. Glad you’re feeling better too. Our sun is shining today, and our card group is meeting so will be a perfect day. Edna B. Thank you for the video. It was extremely informative, especially to someone like me who is just getting into stamping. Great video! Best of luck on your checkup today! I understand how to do it! Thank you for teaching me. I love watching your videos; I get so much out of them. You are looking so much better. Keep healing. 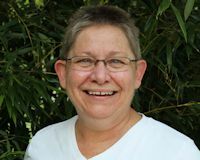 Wonderful Sherry – thanks for doing the video for us visual people it’s such a tremendous help. I now know what I was doing wrong with my attempts. Keep up the awsome tutes and have a super wonderful day ! Love the cards! Wonderful video! I hope everything turned out well with the doctor visit. Thanks so much for the video. I can’t work out how to do things if it’s just written down so really appreciate you taking the time to do these tutorials. Wonderful tutorial! You did a super job. And I am a purple girl also. Great, great, great Sherry!! 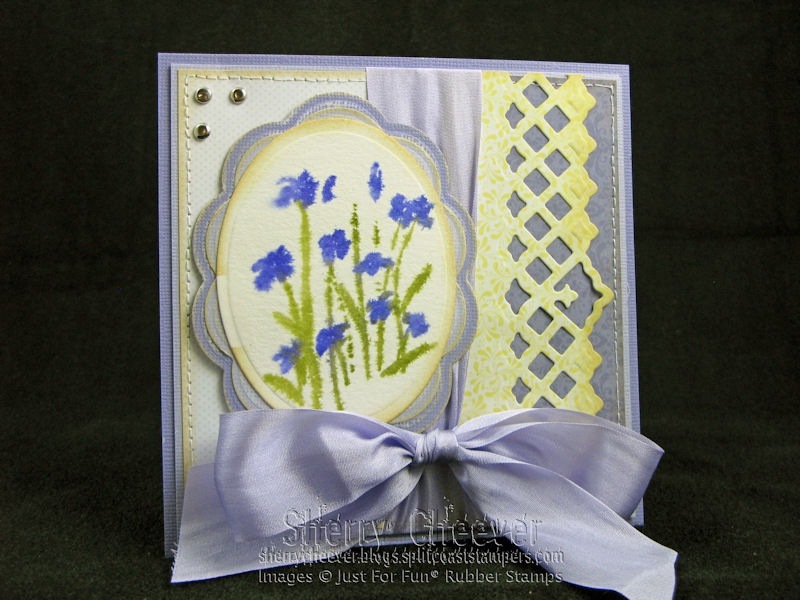 I really liked the different effects of the misting and stamping! Thanks for showing the cards on your blog, too, so that we can see them for a time! Wow! Great video!! Now I know why mine misting didn’t turn out. I wasn’t doing it right! Seeing how you did it was a tremendous help. Thanks for the visual tutorial! Will refer to it often while I work on the different techniques. good luck with your checkup sherry! loved the video. a little bit different look with each technique….sweet! Excellent video. Great examples of the different effects.